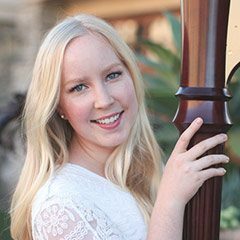 Harpist Caroline Hales (BM ’16), a master’s candidate in the USC Thornton Strings program, recently won the Music Academy of the West’s 2018 Concerto Competition. Hales, who studies with JoAnn Turovsky, serves as principal harpist with the American Youth Symphony, the Debut Chamber Orchestra, and the USC Thornton Symphony. Winners of the Concerto Competition will perform as soloists with the Academy Festival Orchestra during the Music Academy’s summer 2019 season.